A thorough discussion of contemporary virtue ethics as the field has evolved to offer an alternative to technical/rational ethics. An all-new three-part structure (What is Administrative Evil?, History and Cases, and The Future of Ethics in Praetorian Times) designed to aid in course organization and instruction. All-new cases, including an examination of the Flint water disaster, to provide contemporary examples of how populations can be marginalized and harmed by administrative processes that are blind to their consequences until it is too late. Laying the groundwork for a more ethical and democratic public life – one that recognizes its potential for evil, and avoids state-sponsored dehumanization and destruction – Unmasking Administrative Evil, 5th Edition is required reading for all students of administrative ethics and public service ethics, as well those in other administrative sciences. This book is indispensable to the field of public administration; a discipline which labored far too long under the illusion that morals were somebody else’s business. The nearly effortless way that administrative agencies can slide into routine practices that wreak havoc requires our constant attention. If we don’t learn from what the authors’ have to say in this book, we are consigned to more tragedies like those they describe. "The field of public administration rightly salutes public service as a normative good. However, this indispensable volume also rightly reminds us that public bureaucracies are capable of immense evil. 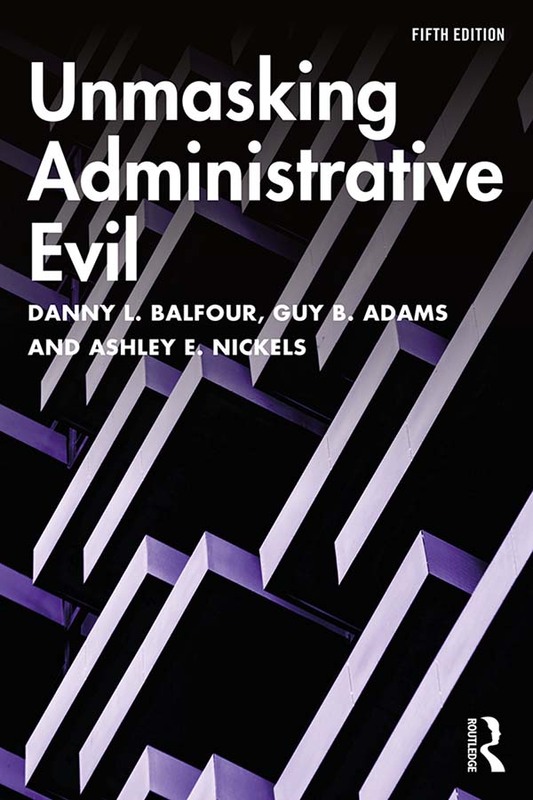 Now in its fifth edition, Unmasking Administrative Evil should be required reading in master of public administration and policy programs and among civil servants everywhere." Part I: What is Administrative Evil? Danny L. Balfour is Professor of Public Administration at Grand Valley State University, USA, where he teaches public management, ethics, organization theory, strategic management, and history of the Holocaust. He has served as book review editor for Public Administration Review, was the founding managing editor of the Journal of Public Affairs Education, and serves on the editorial board of several public affairs journals. Guy B. Adams is Professor Emeritus of Public Affairs in the Harry S Truman School of Public Affairs at the University of Missouri, USA. He has more than 60 publications, including books, book chapters, and articles in top national and international public administration journals, and served for many years as the co-editor-in-chief of the American Review of Public Administration. In 2017, Adams received the Dwight Waldo Award from the American Society of Public Administration (ASPA) and the Lifetime Achievement Award from ASPA’s Section on Ethics and Integrity in Governance. Ashley E. Nickels is Assistant Professor of Political Science at Kent State University, USA. As an interdisciplinary scholar, her research focuses on issues of power, privilege, and democratic participation in the fields of urban politics, nonprofit management, and public administration, and she is highly influenced by her years working in feminist community activism. Dr. Nickels is the author of the forthcoming book, Power Participation and Protest in Flint, Michigan and co-editor (with Jason D. Rivera) of Community Development and Public Administration Theory (Routledge, 2018). She also serves on the board of editors for the Journal of Public Affairs Education, and as chair-elect of ARNOVA's section on Community and Grassroots Associations.